San Francisco District Attorney George Gascon told NBC Bay Area Thursday that his office had identified five officers who sent offensive text messages as part of an ongoing probe into 5,000 pages of text messages. Gascon says investigators found “dozens” of offensive texts sent in 2014 to late 2015, including the use of the N-word. Gascon sent a letter to Police Chief Suhr about the discovery on Wednesday, but added he does not know how long the department has known about the content of the messages. Last year, some 14 current and former SFPD officers were identified in a separate text message probe last year and put on administrative duties pending disciplinary charges. 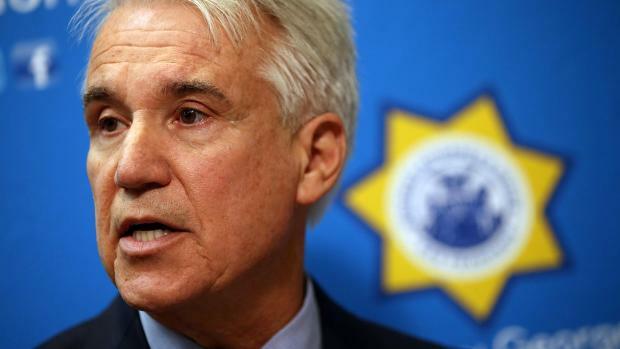 San Francisco District Attorney George Gascon told NBC Bay Area Thursday that his office had identified five officers who sent offensive text messages as part of an ongoing probe into 5,000 pages of text messages. Christie Smith reports. Those charges, however, have been suspended after a judge ruled the charges were not lodged in time under state law. In a letter responding to Gascon that was also provided to the media, Suhr wrote Thursday that the district attorney's office was sent evidence including the text messages on Sept. 21, and that police notified his office on multiple occasions in September, October, November and January of the existence of the texts. "For you to suggest that you discovered the text messages through your own criminal investigation would be disingenuous," Suhr wrote. "This is not new information as our offices have been working closely on this case with at least three members of your staff to ensure the fair administration of justice." The police union has frequently publicly criticized Gascon and a blue ribbon panel he created last year to investigate police bias and misconduct. Among the union's allegations is that Gascon made disparaging remarks about minorities during a dinner in 2010 when he was police chief, an allegation that Gascon has denied. “To be a San Francisco Police Officer is a sacred trust granted to us by the people we serve. When an officer violates that trust he or she must be held accountable. The San Francisco Police Officers' Association condemns the appalling racist behavior committed by a handful of officers. They have disgraced the uniform and their profession. This conduct will not be tolerated in the SFPD nor in the POA. Chief Suhr has the full support of the POA to take appropriate disciplinary action that protects the due process rights of the officers. learned of the text messages."